Paul Greengrass of the Jason Bourne franchise directs this adaptation of Richard Phillips and Steven Tatty's book, "A Captain's Duty: Somali Pirates, Navy SEALS, and Dangerous Days at Sea." 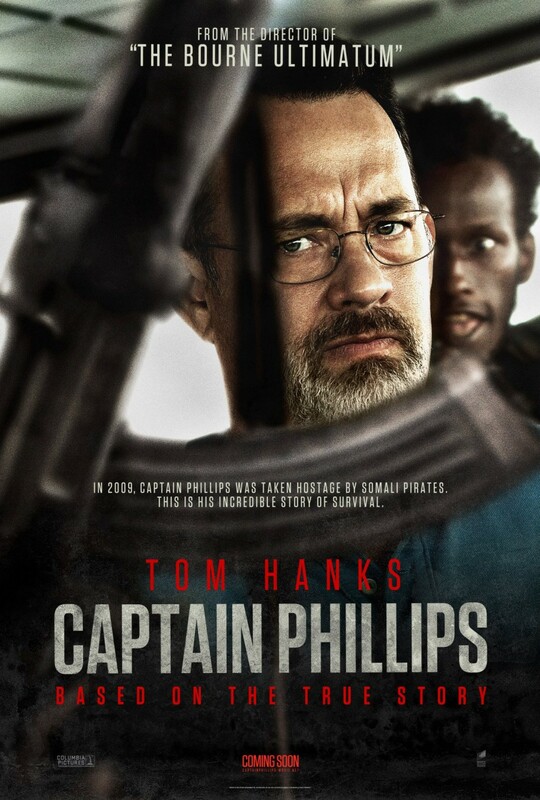 The film is called "Captain Phillips," and it stars the most trusted man in the world, Tom Hanks. "Captain Phillips is director Paul Greengrass’s multi-layered examination of the 2009 hijacking of the U.S. container ship Maersk Alabama by a crew of Somali pirates. It is—through Greengrass’s distinctive lens—simultaneously a pulse-pounding thriller and a complex portrait of the myriad effects of globalization. 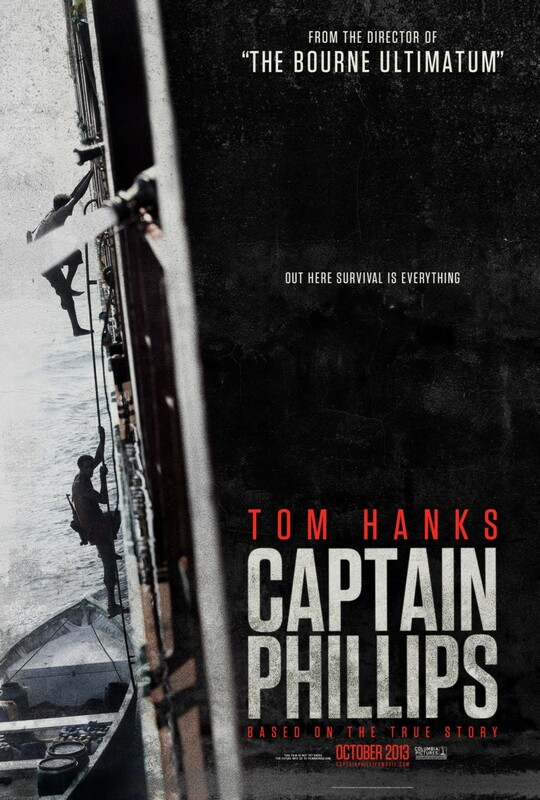 The film focuses on the relationship between the Alabama’s commanding officer, Captain Richard Phillips (two time Academy Award® winner Tom Hanks), and his Somali counterpart, Muse (Barkhad Abdi). Set on an incontrovertible collision course off the coast of Somalia, both men will find themselves paying the human toll for economic forces outside of their control. The film is directed by Academy Award nominee Paul Greengrass, from a screenplay by Billy Ray and based upon the book, A Captain’s Duty: Somali Pirates, Navy SEALs, and Dangerous Days at Sea, by Richard Phillips with Stephan Talty. The film is produced by Scott Rudin, Dana Brunetti, and Michael De Luca. " Warner Bros. released this IMAX 3D poster from director Alfonso Cuarón. Take a look at the poster, and tell me you don't feel alone in the vast wide emptiness of space? Yet, at the same time, don't you feel claustrophobic? Alfonso Cuarón, directed the critically acclaimed "Children of Men," "Harry Potter and the Prisoner of Azkaban," and the Spanish film, "Y Tu Mamá También," "Gravity" was written by Cuarón and his son Jonás. 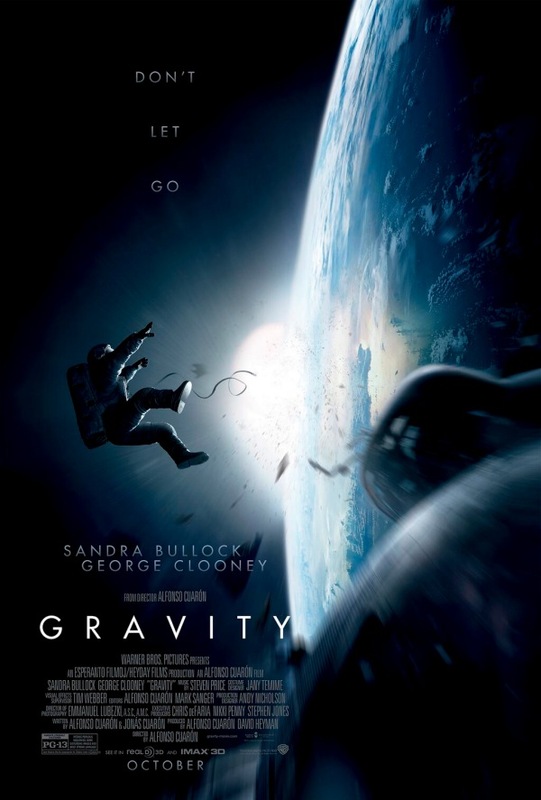 Cuarón's film, Gravity is about two astronauts attempt to return to earth after debris crashes into their space shuttle, leaving them drifting alone in space. Dr. Ryan Stone (Bullock) is a medical engineer on her first Space Shuttle mission and is accompanied by veteran astronaut Matt Kowalsky, who is in command of the shuttle flight, due to be his last. During a spacewalk, the space shuttle is destroyed, and Stone and Kowalsky are stranded in space with no communications with Earth. 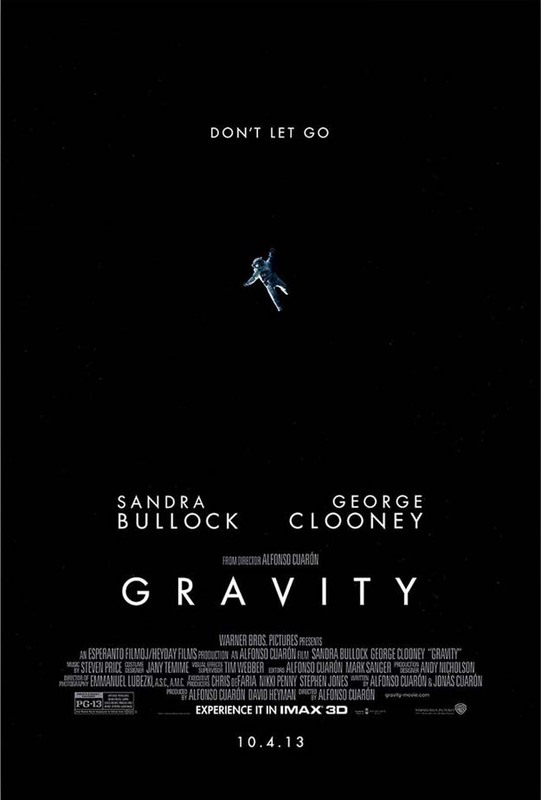 Warner Bros. is releasing "Gravity" to theaters in the U.S. on October 4, and in the U.K. on October 18th, 2013. So, you are saying. WTF happened to Riddick? The last we saw him he was sitting on the Necromonger throne with Lord Vaako at his feet?.Well, here is the answer to that question. This 5 minute, 48 second "Motion Comic" explains Riddick's departure from the position of Lord Marshal. The motion comic leads us directly into whos, whats, wheres, and whys of Universal's new film "Riddick,." here is the synopsis. Matt Damon ultra elite soldier in Neil Blomkamp's class warfare film conducts a heist on an a VIP from Elysium. The VIP is protected by security robots featured in "The Tech of Elysium" featurette. Occasionally you find a film that very few people have heard of, and you find, that not only is the movie well made, has decent production values, good dialog, an effective musical score, and is well acted. That is exactly the case with "A Viking Saga: Darkest Day." While the film is not epic in any sense of the term, it is a solid period piece. Welsh director, Chris Crow does so much with so little. The film is rated R for the violence and runs just under an hour and a half. Drawn from a rich history of England and Wales, writers Graham Davidson and Crow put together an adventure story that not only give homage to the hero's journey, but also makes an interesting, but not epic story. A price of historical fiction, it sets the framework for the story of a small group of adventurer's trek across England in order to deliver the book of the White Christ to monastery in Northern Scotland. After a Viking raid on the monastery Holy Isle of Lindisfarne, two monks escape the carnage to deliver the illuminated book now known as the Lindisfarne Gospels. The book is a beautifully leather bound, jeweled encrusted, illustrated copy of the four Gospels of the Christian Bible. The Vikings are portrayed as ruthless pirates whose goal has switched from gold and other traditional plunder, to the search of the holy book. Hadrada (Joshua Richards) King of Ekero (in Sweden) has raided the Abbey, tortured the monks, demanding the whereabouts of the holy book of the white Christ. 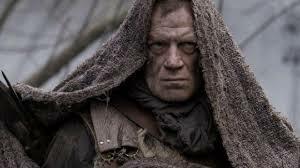 He is a pagan searching for power over the Anglo-Saxons in Briton. 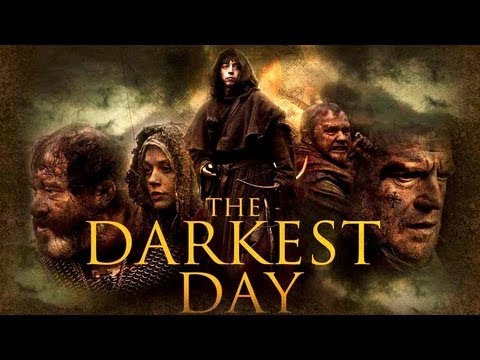 "A Viking Saga: Darkest Day" becomes a commentary on a man twisting of religion for his own gain. Hadrada believes that with the book he can control the people, and make his son king of this land. The date is Jan 8, 793 and an elder Abbot Athelstan (Christopher Godwin), and the young, inexperienced monk Hereward (Marc Pickering) flee through the cold, and misty, woods north to Iona, Scotland. Along the way, they meet the warrior Aethelwulf, then later, the Scot- Pictish girl Eara (Helen Rhys). 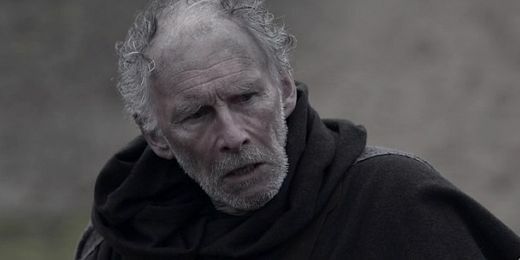 Hamal (Michael Jibson), an usurper to Hadrada's throne, vies for power, and Yngvar (Peter Jibson), the king's son falls in battle with Aethelwulf. As I said before the acting is solid, the sword fights look realistic, and the photography is very well done. The fight scenes are violent in that the goal was to depict the world of that time was brutal and life was cheap. As their journey progresses, the young and frightened Hereward, learns lesson of belief, and grows in faith, endurance, and what it takes to serve Christ and his people. This is one of the films that appeals to fans of historical fiction, or to those who are into the History channel's "Viking" series, or into HBO's "Game of Thrones." The film is enjoyable, and interesting to watch. 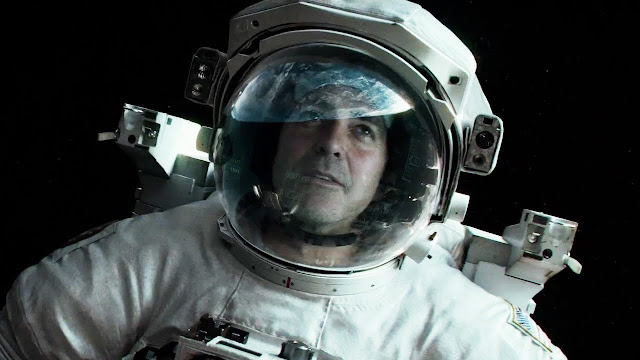 After releasing the "Detached" and "Drifting" trailers just the other day, Warner Bros. released a new trailer for the new George Clooney ("Solaris", "Up In The Air"), and Sandra Bullock. ("The Heat," "Premonition") film, "Gravity." Gravity is about two astronauts attempt to return to earth after debris crashes into their space shuttle, leaving them drifting alone in space. Dr. Ryan Stone (Bullock) is a medical engineer on her first Space Shuttle mission and is accompanied by veteran astronaut Matt Kowalsky, who is in command of the shuttle flight, due to be his last. During a spacewalk, the space shuttle is destroyed, and Stone and Kowalsky are stranded in space with no communications with Earth. The trailer shown above shows the moment after a catastrophic accident. Astronauts Kowalsky (Clooney), and Dr.Ryan Stone (Bullock) are struggling to hold on to each other after wreckage of a destroyed Russian satellite causes havoc for the space shuttle working on the International Space Station. Alfonso Cuarón directs this thriller set in space. He is known for directing the critically acclaimed "Children of Men," "Harry Potter and the Prisoner of Azkaban," and the Spanish film, "Y Tu Mamá También," "Gravity" was written by Cuarón and his son Jonás. Warner Bros. is releasing "Gravity" to theaters in the U.S. on October 4, and in the U.K. on October 18, 2013. 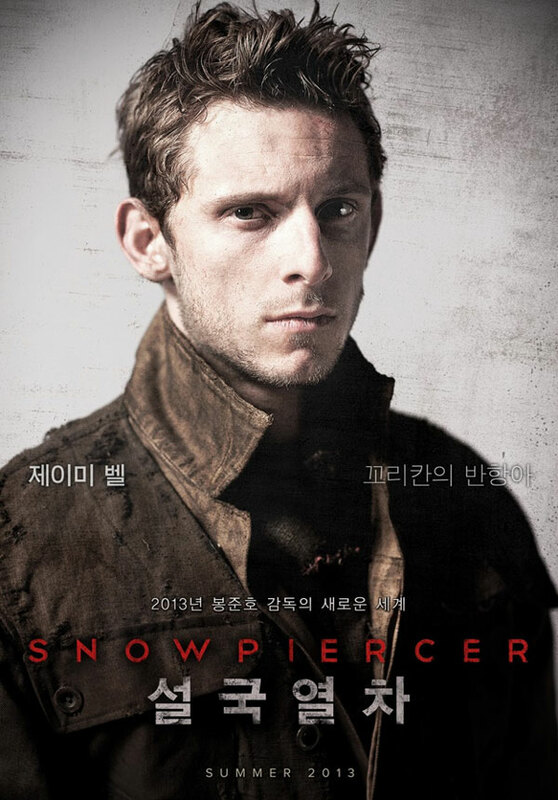 The Weinstein Company has released some pretty cool character posters for the upcoming film, "Snowpiercer." Above, is Chris Evan's character named Curtis, the protagonist of the film. 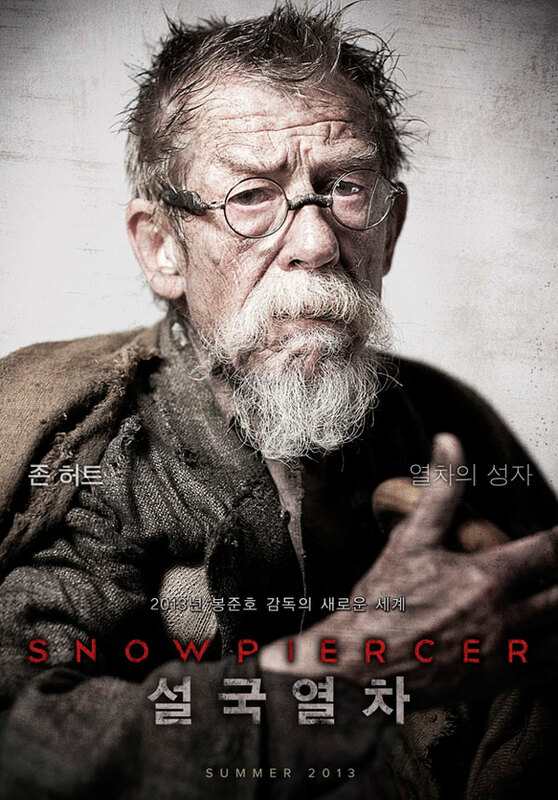 From Korean director Bong Joon-ho in his first English film, "Snowpiercer," is based on the graphic novel by Jacques Lob and Jean-Marc Rochette titled "Le Transperceneige." A character poster for Gilliam, played by John Hurt is shown above.. The story centers around a future where humans lost the war against global warming and the world is a frozen wasteland. The survivors live on a train that circles the Earth about once every year. "In a future where a failed global-warming experiment kills off most life on the planet, a class system evolves aboard the Snowpiercer, a train that travels around the globe via a perpetual-motion engine." Below is the new trailer. I must admit, that each trailer creates interest, yet we are still not sure exactly what the whole plot is about in "Snowpiercer." In the clip above, those that have, live a quite comfortable life, on the train. However, those that have not, live in squalor in other sections of train near the back. Curtis (Evans), rises up and leads a revolt to take over the train. The film stars Chris Evans ("The Avengers," "Captain America: The First Avenger," "Sunshine") as Curtis, Jamie Bell ("The Eagle," "Defiance"), John Hurt ("Alien," "1984") as Edgar, Tilda Swinton ("Constantine," "The Chronicles of Narnia") as Mason, Octavia Spencer ("The Help") as Tanya, and Ed Harris ("The Right Stuff," "The Abyss") plays Wilford. In a weird twist on Jean-Paul Sartre's concept that Hell is other people, the survivors of Global Warming, are trapped in a closed society, where class warfare begins and festers on the "Snowpiercer." The train travels around the globe and is powered by a sacred perpetual-motion engine. 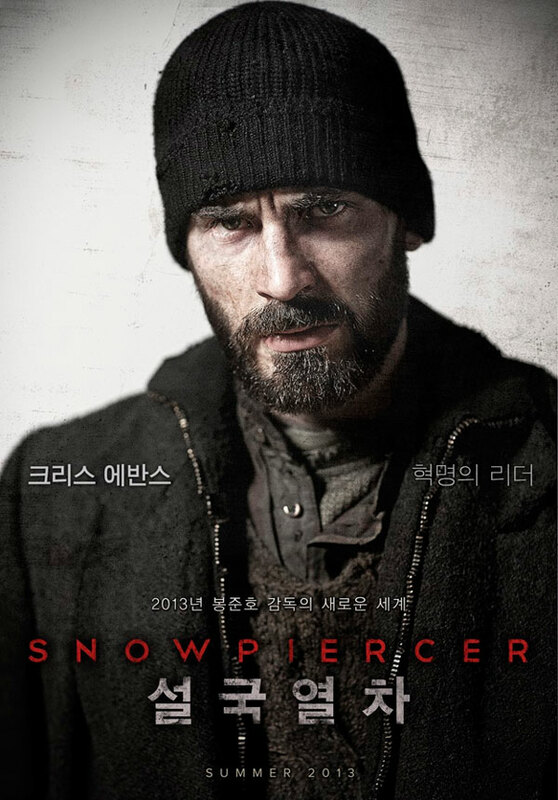 The Weinstein Company hasn't a U.S.theatrical release date yet, however, "Snowpiercer" is due out in Korea on August 1st, 2013. Hollywood is taking on adapting a popular cultural story from Japanese history. The story of the 47 ronin was handed down in various forms throughout history. Retold in many forms, the story has been adapted by the Japanese cinema about 7 times now. Universal Pictures has added a fantasy element to the story and cast an American actor as the lead. 47 Ronin tells the story of the men left without a leader when their daimyo is killed by Lord Kira. Without a leader, the ronin seek revenge of their lord and spend the next two years planning and carrying out mission, as they felt honor bound to do. The film stars Keanu Reeves ("The Matrix" trilogy, "The Day The Earth Stood Still") as Kai. as a half British, half Japanese outcast. Hiroyuki Sanada ("Sunshine," "Ringu," "The Last Samurai") leads the group of 47 the loyal and dutiful samurai n their quest for vengeance and honor. Lord Kira, the reason for vengeance is played by Tadanobu Asano ("Battleship").Adding additional layers to this traditionally male story are Rinko Kikuchi from Guillermo del Toro's "Pacific Rim," and Kō Shibasaki from 2000's "Battle Royale" making her Hollywood film debut as Kai's (Reeves) love interest. This is an English, Japanese film and is the seventh film adaptation of the 47 Ronin story, however, this is the first English version. In the trailer (above) Ōishi (Hiroyuki Sanada) is searching for the half-breed, outcast Kai (Reeves) to join him and the others in the quest for revenge. Witches and magic and the fantastic abound in director Carl Rinsch's motion picture debut. The story and screen writers have an impressive set of credentials. First there is Chris Morgan, who is responsible for writing the "Fast & Furious" franchise films, and the Angelina Jolie and James McAvoy action-thriller, "Wanted." Second is Hossein Amini who wrote "Snow White and the Huntsman," "Drive," and "Killshot." Finaly, Walter Hamada who has served as producer or executive producer on films such as 2010's "A Nightmare on Elm Street," and "Friday the 13th." Hamada is also an executive producer for "47 Ronin." Carl Rinsch has directed several video shorts, and it was Universal who sought his services and gave him an initial budget of $170 million. After budget overruns and retakes the film is set to release against Peter Jackson's "The Hobbit: The Desolation of Smaug," which opens on December 13th, 2013. 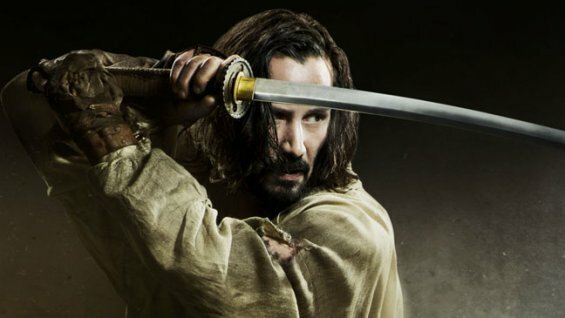 Universal plans on releasing "47 Ronin" in U.S. theaters on Christmas day, 2013. The U.K. premiere is on December 26th, 2013. "47 Ronin (2013 film)." Wikipedia, The Free Encyclopedia. Wikimedia Foundation, Inc. 25 July 2013. 25 July 2013. 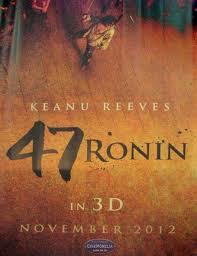 "Forty-seven Ronin" Wikipedia, The Free Encyclopedia. Wikimedia Foundation, Inc. 11 July 2013. 25 July 2013. "Chūshingura" Wikipedia, The Free Encyclopedia. Wikimedia Foundation, Inc. 11 July 2013. 25 July 2013. "Ōishi Yoshio" Wikipedia, The Free Encyclopedia. Wikimedia Foundation, Inc. 31 March 2013. 25 July 2013. The year is 2045 and instead of dealing with a developing gap in social class structure, "The Colony" focuses humanity's attempt at battling the forces of nature, finding ways to grow the food needed for survival, dealing with injuries, and disease. 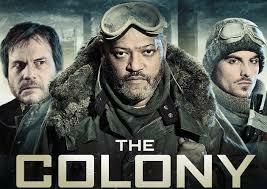 The story follows the inhabitants of Colony 7, commanded by Briggs (Laurence Fishburne) and Mason (Bill Paxton). In the International trailer (above) Colony 7 gets an emergency call from Colony 5 seeking assistance. Briggs decides that he will lead a team to travel to the beleaguered colony and investigate. They find the colony overrun by cannibals and upon returning, Mason (Paxton) has taken over the colony. Composer Jeff Danna provides the score for "The Colony." Danna has worked on films such as "Silent Hill," and "Resident Evil: Apocalypse." The Colony has a U.S. release date of September 20th, 2013. Canada had a limited release on April 12, 2013. "The Colony" is a Canadian production. Warner Bros. released two more trailers for the film, "Gravity." A thriller set in space, just outside of Earth's orbit. The film stars George Clooney ("Solaris", "Up In The Air"), and Sandra Bullock. ("The Heat," "Premonition"). Drawing on the the tension of space disaster films like "Apollo 13," and 1961's "Marooned." George Clooney is no stranger to a spacesuit. In 2002, he donned one as psychiatrist Chris Kelvin in Steven Soderbergh's remake of Andrei Tarkovsky's film adaption of Stanislaw Lem's 1961 novel, "Solaris." Sandra Bullock, who plays mostly comedic, romantic, or dramatic roles spends most if not all of her time in a bulky spacesuit. The trailer shown above is titled "Detached" and it shows the moment of the accident. Debris from the destruction of a Russian satellite flies past the the space shuttle, Kowalsky (Clooney), and sending Dr.Stone (Bullock) spiraling off into the void. In the trailer titled "Drifting," we get Dr. Stone's point of view of the incredible vastness and loneliness of the vacuum we call space. It has been has been seven years since the director of "Children of Men," "Harry Potter and the Prisoner of Azkaban," and the tender "Y Tu Mamá También," has brought us a feature film. Alfonso Cuarón has been spending his time making a couple of documentaries, and an episode of a TV series called "Believe." The story was developed by Alfonso and his son Jonás. In 2010 Warner Bros. obtained the rights to the movie and filming started in 2011. 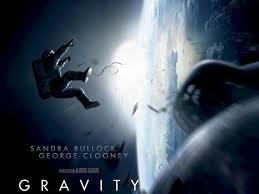 You can look for "Gravity" in theaters on October 4, 2013. 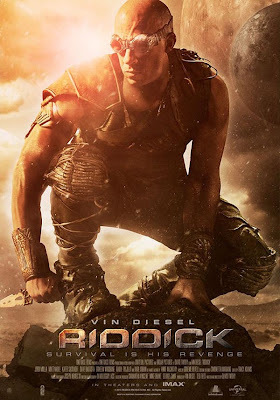 Riddick returns to the big screen this September. More information trickles out to us. We have another trailer for your viewing pleasure. Once again Riddick (Diesel) is one the run. This time he battles vicious mercs and wild creatures. See the synopsis below. "The infamous Riddick has been left for dead on a sun-scorched planet that appears to be lifeless. Soon, however, he finds himself fighting for survival against alien predators more lethal than any human he's encountered. The only way off is for Riddick to activate an emergency beacon and alert mercenaries who rapidly descend to the planet in search of their bounty. The first ship to arrive carries a new breed of merc, more lethal and violent, while the second is captained by a man whose pursuit of Riddick is more personal. With time running out and a storm on the horizon that no one could survive, his hunters won't leave the planet without Riddick's head as their trophy. 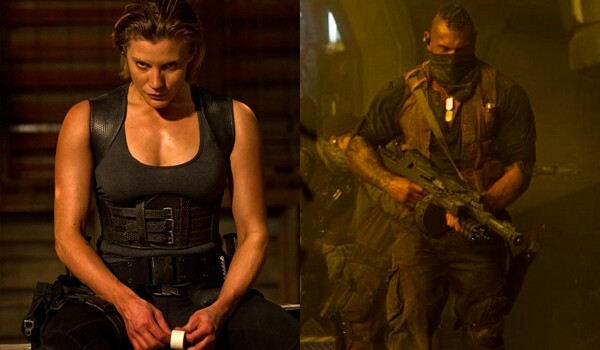 Written by Universal Pictures"
The film also stars Karl Urban as Lord Vaako, Katee Sackhoff from "Battlestar Galactica" as a mercenary named Dahl. Outlander ~ Beowulf For The Modern Age.